Made from 4-1 5/16id 14ga Aluminum (except the steel on the shoulders). Weighs 8lbs. 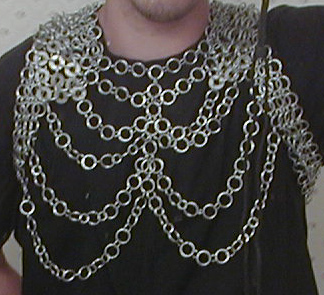 The shirt is made from 14ga 1/2id rings in a 6-1 pattern and weighs 45lbs. The coif is 7/16id 14ga 4-1 pattern and weighs about 8lbs. The shirt is 17ga 5/16id 4-1pattern and weighs 20lbs. The coif is 17ga 5/15id and weighs about 5lbs.